Many observers believe the Pistons still have the best starting five in the Eastern Conference. But the wild card appears once again to be Rasheed Wallace, whose moods can light up or melt down the town. CENTRAL: 1 | EAST: 1 One last try for greatness before the Bulls mature, the Celtics click and LeBron becomes completely unstoppable. For now the East's most accomplished nucleus will have just enough heart and savvy to get to the NBA Finals. ESPN.com CENTRAL: 2 | EAST: 2 Look for Jason Maxiell to have a breakout year. 'Sheed lost 25 pounds in the offseason, and is back playing at a high level. Frontcourt depth is an issue; this team can't have starters logging too many minutes again. CENTRAL: 2 | EAST: 3 Basically the same cast of characters from the disappointment of losing four straight to the Cavs. Some say Rodney Stuckey can really play, but there's concern about lack of significant changes. CENTRAL: 3 | EAST: 5 Still a dangerous team, but the days of Finals appearances are probably over. The youth of Jason Maxiell, Amir Johnson and Rodney Stuckey will help, but they'll have to be dynamic for the Pistons to contend again. CENTRAL: 1 | EAST: 1 What happened to Sheed's vow to make up for costing Motor City a title two years ago? Now he owes them for two missteps after last season's meltdown against the Cavs. If he really is committed to squaring his account, who the coach is won't matter. If he isn't, nothing matters. CENTRAL: 1 | EAST: 1 The Pistons still have one of the best veteran starting fives and now have their deepest bench since the title run. If Amir Johnson and Rodney Stuckey live up to expectations, they'll be in the Finals. CENTRAL: 1 | EAST: 1 Practical wisdom says they're due for an implosion, but it's hard to ignore their track record. The same questions persist, but the Pistons will be overlooked in the East because of Boston. And we saw in 2004 how well they play when discounted. CENTRAL: 3 | EAST: 5 This is the best bench of the Billups-Hamilton era, so the Pistons can withstand injuries if and when they ever have any. Bigger issue is the 'Sheed-Saunders relationship and how it rubs off on the others. CENTRAL: 1 | EAST: 1 It'll be interesting to see if Chauncey Billups continues to fade as much as he did in last season's Eastern Conference finals. The Rasheed Wallace-Flip Saunders dynamic remains shaky, but we like the move of Antonio McDyess into the starting five. He still has a lot left. CENTRAL: 1 | EAST: 2 Getting back to the Finals probably does depend on how 'Sheed and Flip coexist, but I'll keep saying it: The Pistons won't slip nearly as much as people expect if their kids are as good as projected. After years of ragging on the Pistons' bench, I now must report that they have as much in the tank as anyone in basketball, especially in the frontcourt. 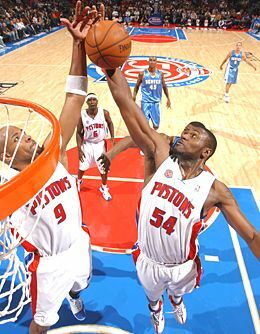 The starting combo of Rasheed Wallace and Antonio McDyess is solid, but the Pistons' real strength is off the bench. Jason Maxiell is an active, tough forward who makes plays without needing the ball, while Nazr Mohammed, though strangely unloved by his employers, remains a solid performer. But the real prize here is Amir Johnson, a 21-year-old who turned pro out of high school and barely has been seen since. The Pistons swear he's a killer and his numbers from the D-League are spectacular; at worst, he should be a stud shot-blocker right out of the chute. So stacked was Detroit that letting Dale Davis and perhaps Chris Webber leave wasn't even a difficult decision. If Cheick Samb acclimates quickly and discovers the joys of steak, he could add to the mix, too. Scouting report: Prince's biggest contribution comes at the defensive end. He was a deserving second-team All-Defense pick last season, his third straight second-team mention. What's ironic is that Prince is most famous for a blocked shot -- his dramatic swat on Reggie Miller in the 2004 conference finals -- but he doesn't really block that many shots. Prince ranked 19th among small forwards in blocks per minute last season despite being among the taller players at his position, and that's been the case his whole career. That's partly because despite long arms and decent quickness, Prince almost never gambles. That keeps his blocks down and also led to his having the third-lowest rate of steals at his position. Instead, Prince opts to make opponents shoot over his incredibly long arms, an effective gambit given that he's already taller than most of the players he guards at 6-9. Prince's length also allows him to play a step off his man, giving him more time to react to drives and allowing him to play the low-risk style that's been so effective for him. Prince's size is a major asset in zones too, as he can get to the corner quickly to bother shots. Offensively, Prince's jumper is ugly but effective, especially off the catch. He also can abuse smaller wing players on post-ups from the right block, where he backs his man down and floats a short hook or spins back to his right for a shot. This only works on the right side for some reason -- on his rare post-ups on the left he seemingly has no idea what to do. In transition he's an impressive dunker, especially on alley-oops, but the Pistons rarely run. Despite his thin frame, Prince is perhaps the league's most durable player. He hasn't missed a single game since joining Detroit's starting lineup in 2003-04. 2007-08 outlook: Coming off three seasons that from a distance look virtually identical, it's hard to imagine anything different coming along this year. Prince's role is unlikely to change any as the Pistons mostly return the same core, and his output is unlikely to change because players rarely change their spots at 27. It'd be nice to see him launch some more 3s, but otherwise expect another 14 points per game and another second-team All-Defense selection. If you got some quality time with your team's GM (like those lucky dudes from 3 Shades of Blue), what would you ask? Cleveland fans aside, most picked the Pistons as Eastern Conference champion last season. What happened to the Pistons in that series, and what have you addressed this season to get them to the Finals? If you could do things all over again, knowing what you know about Darko and the others who followed him in the 2003 NBA draft, who would be your No. 2 pick? 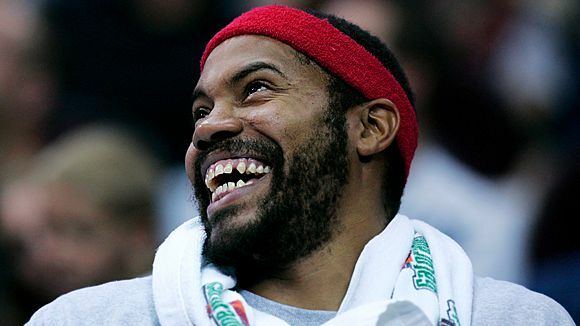 If you could do one thing to Rasheed Wallace to cut down on his technical difficulties, besides putting him on sedatives, what would it be? For the first time in years, Detroit is touting its depth. Yeah, we're talking about you, (L-R) Jarvis Hayes, Flip Murray and Jason Maxiell. The theme for Flip Saunders this season is one based on "trust." Does he trust that his core group of veterans can carry most of the load all season and be ready to do the same in the playoffs? Or does he give his young guys lots of chances early on, trusting that his team will still be in contention with a few more losses, but will be deeper and fresher for a late-season run? • David Thorpe, Scouts Inc.
Maxiell exudes energy and has tons of potential. In 14 minutes a game in '06-07, he averaged 5.0 points, 2.8 rebounds, 0.5 steals and 0.9 blocks while shooting 50 percent from the field. If his minutes double and his other numbers increase proportionately, he could be a viable fantasy center ... if he can improve his 53 percent foul shooting. Hayes does a little bit of everything, but does not excel enough in any one category to make him worth drafting. He is a career 40 percent shooter whose 2006-07 numbers were all below his career averages of 8.9 points, 3.4 rebounds, 1.3 assists and 0.8 steals. Despite the Pistons' emphasis on developing their bench, it is hard to imagine Hayes being much of a factor. Stay away.